Bringing a tidbit to the surface the muskrats were content to feed in my presence with safety only a quick dive away. My earliest memories of muskrats are of my grandfather trapping a few each autumn from the creek that borders our family farm. From his stories he had trapped muskrats quite a bit in his younger days when the money he made from the furs was important to him and grandma as they tried to make ends meet during the great depression. As a little kid I would tag along with him as he carefully concealed his Victor #1 long-spring traps at the bottom of muskrat slides with the trap wired to a rock placed in deeper water so as to drown the rat once it was caught. Granddad had a couple of wire fur stretchers and a few boards whittled into the correct shape for drying the fur. I can still remember the sweet musky smell of the drying furs and the tales he would tell as he skinned, fleshed and stretched the pelts. One of his favorite tales was of one particularly tough depression winter. He often spoke of those times, as he and many of his generation never forgot how difficult the Great Depression was. He told how that as long as they were able to keep the interest paid on their farm mortgage that the bank would not foreclose and in that particular winter the fur from his trapline provided the money to cover the interest. To this day I when I encounter the little water rats they always bring back the long ago memories of granddad’s trapping and his stories of how he and grandma, a young couple with a recently purchased farm just starting a family, coped with the hardships that the Great Depression threw their way. 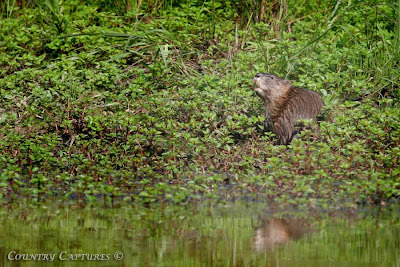 Beautiful photos of the muskrat! I enjoyed reading your memories of your grandfather and how he trapped the muskrat. We have muskrat here in Alaska also and the Native people use the skins to make fur parkas. When I first moved to Alaska 36 years ago you would see lots of fur parkas around town, but with the modern lightweight fabrics available to make warm coats you don't see them as often. I always thought the muskrat parkas were the most beautiful. What a beautiful post with both beautiful pictures of the muskrat and memories of your family that I enjoyed a lot. Thanks for sharing these family moment with us! Great shot Coy, love the tale from your Grandfather too. Come take a trip with me on the London Eye. Nice photos, Coy - and I too enjoyed your story. I have many fond memories of my two grandfathers too. 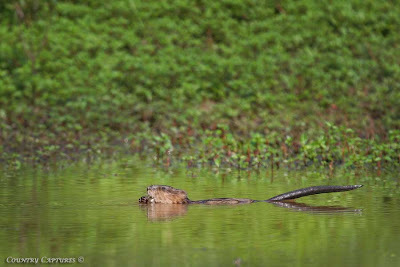 I am glad you finally got the chance to photograph some muskrats up close. It looks like you had a great encounter with them. It was great meeting your brother this week and maybe I get get to meet you during the rut. He will have a great story and some fantastic video for you to see when he gets home of our adventure this morning. I just hope when I post it I cover it as well as he will. Salty: Neat photos and a great story from your memory. Terrific memories and so special. Glad you could photograph the muskrats. The 2nd photo is so unusual. Like it.